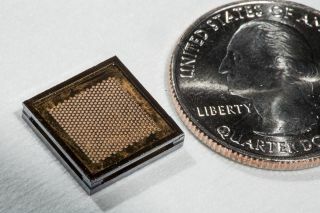 A "thruster chip" designed by Accion Systems is smaller than a quarter, but contains hundreds of microscopic emitters that emit beams of ions. A single TILE thruster engine brings together 36 thruster chips. CAMBRIDGE, Mass. — A new propulsion engine with dime-size thrusters could be used to propel a host of spacecraft, from small satellites to crewed ships designed for interplanetary exploration. The new propulsion engine, called TILE, which stands for Tiled Ionic Liquid Electrospray, could serve as an efficient and lightweight way to keep constellations of small satellites in orbit. Spaceflight companies — including OneWeb, Boeing and SpaceX — want to launch hundreds of thousands of these small satellites to provide broadband internet to everyone around the globe. And because several TILEs can be connected to produce more power, the engine has the potential to propel astronauts to Mars, according to Accion Systems, the company that designed TILE. Bailey developed the underlying propulsion system with Accion co-founder Louis Perna while they were Ph.D. students at MIT. The TILE engine uses a method called ionic liquid electrospray propulsion. The system draws from a decades-old technology for thrusting satellites, called electric propulsion, which uses electromagnetic fields to shoot charged atoms, or ions, out the back of a satellite to push it forward. But these engines, known as Hall-effect thrusters, have some major downsides. First, they use compressed-gas propellants that have to be stored in large, pressurized containers. Hall thrusters also require electric power in a couple of different places, first to charge the particles to create an ionized gas, and then to accelerate that plasma to propel the satellite. All of these things add bulk and weight to the engines, which make them way too big to serve as propulsion systems for small satellites, Bailey said. And thanks to the laws of plasma physics, the engines are just plain impossible to shrink down. "Essentially, you end up running into some problems with really hot electrons and melting the device," she said. A schematic of an Accion Systems TILE thruster engine. In contrast, the TILE's ionic liquid electrospray propulsion system has more in common with a computer chip than a huge, bespoke engine, Bailey said. In fact, Accion calls the dime-size propulsion device a "thruster chip." It's made of hundreds of emitters that produce beams of ions generated from a nontoxic and nonexplosive propellant that's a salt-based solution. An array of 36 thruster chips make up the outward-facing surface of a TILE module, which measures about 4 inches by 4 inches by 5 inches (10 by 10 by 12.5 cm) — about the size of a grapefruit. Beneath the top layer of the module are other components stacked in a particular order, including the salt-based propellant, which is stored in tiny tanks, and the system's power electronics, which run off of the satellites' solar panels and batteries. When the power is on, the battery creates an electric field that draws ions up from the salty propellant and pulls them through the tanks to the thruster chips, which funnel them into a beam and eject them for propulsion. An illustration of the microscopic thrusters in an Accion Systems thruster chip. One to four TILEs could propel a small satellite weighing anywhere from 100 to 440 lbs. (50 to 200 kilograms), Bailey said. Arranging more modules together in a larger array could steer larger satellites, without the added bulk, she added. Bailey and Perna founded Accion Systems in 2014 to commercialize the Til technology. In 2015, the company received a $3 million contract from the U.S. Department of Defense (DOD) to develop their technology. This summer, the company will test the TILE to see how well it can withstand temperature extremes, the vacuum of space, and the shock and vibration of a launch. After it passes those tests, Accion plans to integrate a TILE with a customer satellite, Bailey said. "We're definitely going to space," she added. In another 10 to 15 years, Accion Systems hopes to have the technology refined to make the long journey to Mars. According to the company's estimates, if a crewed spacecraft were to rely on conventional engines, the journey would require so much fuel that the ship would have to support 4,000 Hall thrusters. The fuel tanks alone would equal the size of the International Space Station. But if the trip were made using Accion's TILE propulsion, the engine and fuel system would take up the space of shoebox, Bailey said. You can follow Tracy Staedter at her website tracystaedter.com and @tracy_staedter. Follow us @Spacedotcom, Facebook and Google+. Original article on Space.com.